OneWaySlide is used to change or improve sitting positions in chairs or wheelchairs. OneWaySlide retards forward movement, yet slides backward, making it easy to re-position a patient into a more comfortable position in their chair. It has robust draw straps, which make it easy for caregivers to help patients into more comfortable positions in chairs. 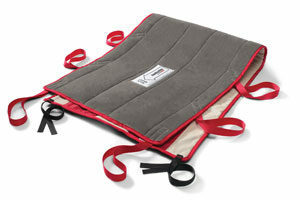 OneWaySlide has a soft padded surface and is very comfortable to sit on.